KEIZER, Oregon – There’s still a faint glimmer of hope that the Spokane Indians can win the Northwest League’s North Division first-half title. 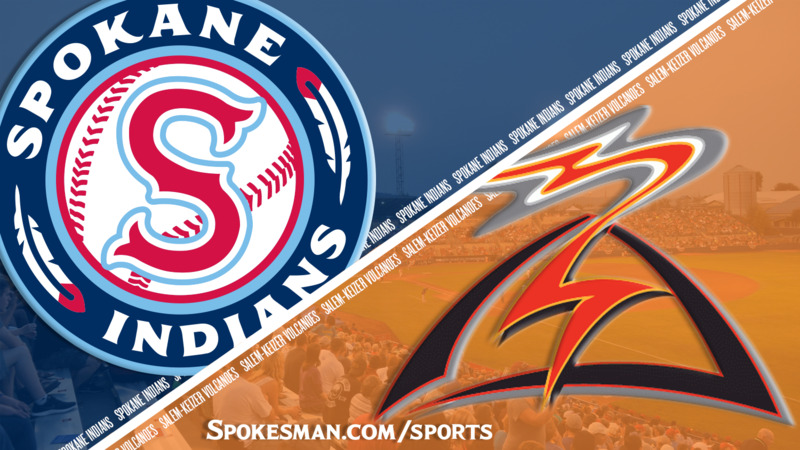 Seth Nordlin pitched eight effective innings and Julio Pablo Martinez hit a two-run homer Friday to guide the Indians to a 5-3 win over the Salem-Keizer Volcanoes in the second game of a five-game series at Volcanoes Stadium. Fourth-place Spokane (16-19) trails first-place Everett (19-16) by three games with three games remaining in the first half. If the teams tied for first place, Spokane would advance to the postseason because of its 4-2 edge over Everett in head-to-head play. But Spokane would be eliminated from the first-half chase with any Everett win or Indians loss in the next three days. Spokane won its fourth consecutive game on the road after starting the season 0-12 away from home. Nordlin (3-1) allowed five hits and three earned runs in eight innings, striking out four and walking none. Emmanuel Clase pitched a perfect ninth for his sixth save. Martinez’s homer, his sixth of the season, capped a three-run second inning and gave the Indians a 4-0 lead. The Indians led 5-1 when S-K’s Aaron Bond hit a two-run homer in the sixth. The Volcanoes dropped to 17-18. Published: July 20, 2018, 9:37 p.m. Updated: July 20, 2018, 10:10 p.m.